Alsace lies in the north-eastern corner of France, tight against the German border. Indeed for various periods of the region’s history this was a turbulent and disputed territory that fell under German control on numerous occasions. 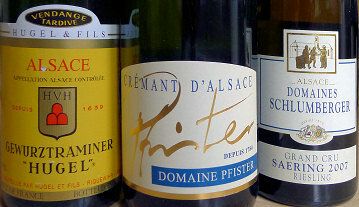 Though today the historic villages and peaceful countryside of Alsace makes it one of France’s tourism gems, both history and climate have shaped the wine industry too, with the most commonly found grapes being Germanic varieties like Gewurztraminer, Riesling and Sylvaner and the predominantly white wines being sold in tall, ‘flute’ bottles. It’s also a region where wine is not so much an ‘industry’ as an artisan occupation dominated by family owned and run domaines. But that is not to say the wine scene is unadventurous or conservative: the high proportion of estates converting to organic and biodynamic farming in recent decades is the perfect example, as investigated in my in-depth article from 2006. I have recently received various sample bottles from their generic promotional body, Alsace Wines, and thought I’d do a little round-up of tastings for wine-pages. I’ve also included a couple of newly listed Alsace wines available in Majestic, and on promotion at time of writing. It was a tasting that certainly showed Alsace’s diversity, with wine styles including sparkling, bone-dry and fully sweet. But it also demonstrated the fine quality that makes these crisp but full wines, with their direct but complex flavours, so popular with their devoted fans. Sylvaner is pretty much despised by many Alsace aficionados, and certainly the trick seems to be to drink them young and fresh. I enjoyed this inexpensive (by Alsace standards) bottling from Leon Beyer, which is a touch muddy on the nose without any really distinct aroma, but the palate delivers a huge blast of citrus and green apple that is relatively straightforward, but washed down some cod in a lemon and mayo crust rather nicely, having a bit of weight and plenty of punch into a bone-dry finish. 85/100. £7.95, The Wine Society. Hugel’s ‘Gentil’ is an easyish-drinking blend of Gewürztraminer, Pinot Gris, Riesling, Muscat and Sylvaner that is ultra-reliable. The nose of the 2009 has a touch of baked apple and spice, and clean, crunchy fruit aromas of apple and citrus. On the palate it is pretty dry, with lot of crisp white fruit minerality and just a little sense of citrus peel juiciness. Long and mouth-watering stuff, it is not packed with personality but has a lovely precision and a bit of authority too. 87/100. Around £10.99, see all UK stockists on wine-searcher.com. Hugel’s Gewurz has a relatively discreet and reserved nose, the grapefruit zest aromatics just giving way to a little more of the flowery, more exotic character. The palate is medium-bodied, lots of good spice and lychee-like Gewurz fruit coming through, and whilst this hints at a just off-dry sweetness, the big solid core of acidity and a bit of phenolic grip adds weight and decision on the finish. 88/100. Around £13.99, see all UK stockists on wine-searcher.com. A bit of waxy character here, lemon and lime fruit. Very nicely pitched – fruity, but intriguingly mineral too. The palate is full of fruit. Is this technically off-dry? Hard to say as the whooshing weight of acidity sweeps through over the quite opulent fruit. Deliciously tangy, packed with flavour and texture. 89/100. £13.99, buy 2 at £10.99 until April 23rd 2012. Majestic. The Blancks have farmed in the village of Kientzheim for generations, yet the screwcap on this bottle shows they move with the times. The nose has a classical Gewurz fragrance, but with a fairly restrained, honey and citrus-peel character too that keeps it quite tight. On the palate this is decidedly off-dry, with a subtle ginger note, plenty of spiciness and all the time a more steely core of mineral and lemon pith to keep it sharp and tighten up those hints of tropical fruits. A great partner for Chinese food, but for prawns and shellfish too. 88/100. £14.99, Waitrose. Subtle smoky and nutty aromatics, the Nivea cream perfume building behind. Fat, creamy and richly off-dry on the palate, this has delicious flavour and a flood of lychee and sweet glacé fruit, with good acidity, but definitely in need of lighter fruity desserts or perhaps spicy Szechuan food for ultimate pleasure. 90/100. £15.99, buy 2 at £12.99 until April 23rd 2012. Majestic. This Late Harvest wine with a decade under its belt has a deepening golden colour. The nose is fabulous: exotic as an essential oil, it is sensual and smoky, with spices and very ripe, tropical fruit notes. On the palate it has quite a viscous texture but is not heavy. The alcohol is very moderate at only 12% ABV, and whilst the ripeness and sweetness of mango and juicy Mandarin orange is there, that pithy, bracing acidity is like a steel rod running through the core of the wine. Not for the heaviest desserts, but glorious stuff that is fairly immortal. 92/100. This was £36.00 at The Wine Society but is not currently showing on their web site. For all available vintages see wine-searcher.com.